Wanderlust Paris is tripling its efforts to get everyone moving on weekends this November! 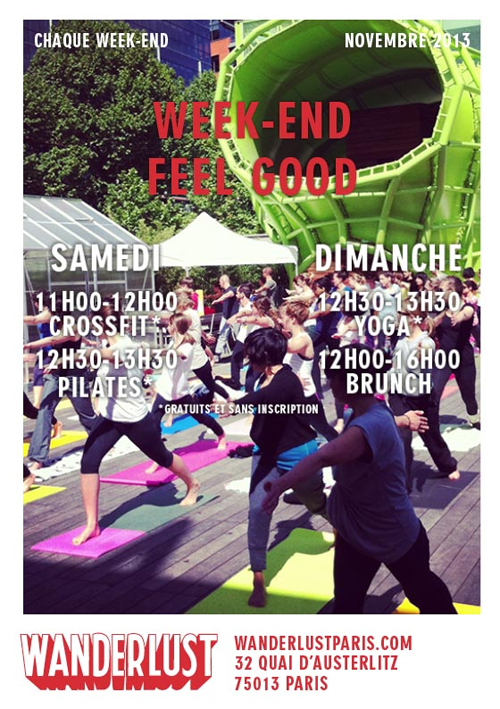 With its “Week-End Feel Good” initiative, Wanderlust is continuing its partnership with Lolë to co-host FREE Crossfit, Pilates, and Yoga classes all month long. This is a great way to sample the various fitness modalities available in Paris, as well as experience the instruction of different teachers, without breaking the bank. We always mention Wanderlust’s weekly events in our Monday morning round-ups.